So it was rainy on my best friend's wedding day. It started pouring at 6am, the moment I set out to take a taxi. The groom was due to arrive at the bride's home at 7am and the 'sisters' (something like bridesmaid but not really either) are to create obstacle games for the groom and his 'brothers' before he can step into the house. 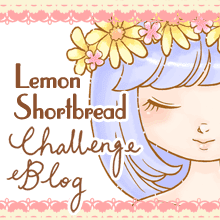 The games we arranged weren't too difficult, just a love song with the loudhailer from the ground floor to her window on the 5th floor, and some food and drink games for sabotage (chili padi biscuits and undiluted lemon juice for an unlucky brother). 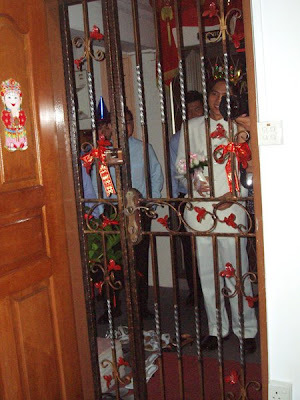 After that, the sisters proceeded to barricade the main gate with a lock and to get in before the groom arrived upstairs. The groom has to bribe us until we are satisfied before we unlock the door. The money will then be split among the 6 of us. Tsk tsk the money wasn't enough in the 1st red packet (a red small envelope containing cash) so negotiations go on till we received the 2nd red packet. We gave him a key encased in ice but too bad we didn't freeze it properly lol! They got it out in a jiffy. It wasn't the key to the main gate. 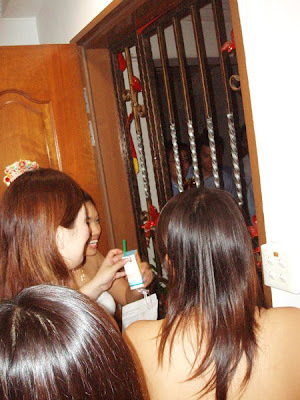 The sisters decided to push for one more red packet before letting him in. That didn't work and we were pressed for time so we let him in after his brothers did 20 star-jumps on behalf of the groom. We are a very lenient bunch! There was a short interview session with the videographer where we posed questions to the groom so we could have it recorded on DVD as evidence of his promise lol. And the ice key thing was the key to the locked bedroom and we had a password which was easy to guess lol 3-words before he could meet his bride. 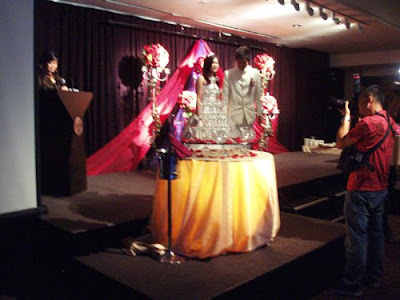 So YH and LY were reunited at last, a quick kiss and lifting her veil and it was time for some phototaking sessions. The 'brothers' were in blue and the 'sisters' in white. Next we were transported to the groom's home for the couple pay respects to his parents. Had to be there by 9am sharp. And the clock chimed 9 just as she stepped in. Tea ceremony is the gesture of offering tea to all the elders (relatives & family) to signify acceptance into the family and respect to elders. 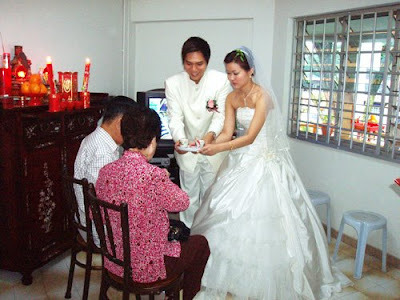 The elders will then give red packets of cash to the couple for blessings. 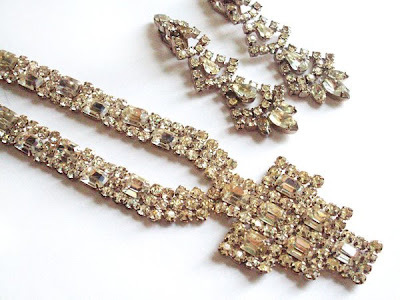 Also jewellery dowry is given to the bride from the groom's mother. 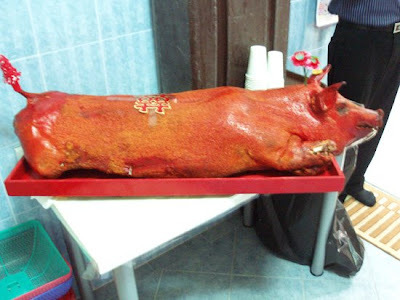 After the tea ceremony it was a quick buffet meal before heading back to the bride's home... with a very huge roasted pig that was used for offerings. The pig is rather creepy indeed! 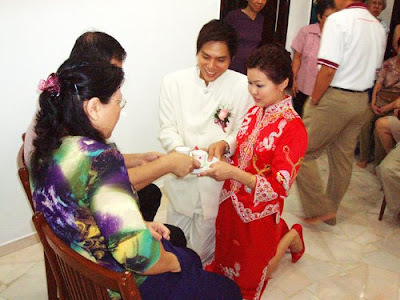 Next is the tea ceremony for the bride's relatives and family. Pretty LY is dressed in the traditional chinese 'kua' for the event. Done for the morning! It's time for more food at the bride's home. After that we split home and come prepared for the next agenda which is the very important dinner banquet at the hotel! Oh yes there is no solemnisation for this wedding, that was done at the Registry of Marriage 2 years ago. Solemnisation and marriage vows applies on that day only if you got married in a church. The reception! I was the audio video person along with another friend. The reception consists of the morning's 'sisters' and family. The pink box you see on the table is the red packet collection box where invited guests will drop their well-wishes of cash in red packets. A guestbook is on the table. 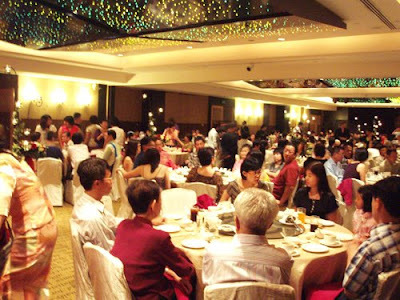 Guests are allocated tables according to relations. The dinner ballroom. No dance floor though, just eat! It was an 8-course dinner I recall. And yes shark's fin was on the menu. The stage with champagne glasses and speeches to be made. A white screen on the left is where the DVD montages will be shown on cue! And of course a full glass of red wine each. They got it down quick! 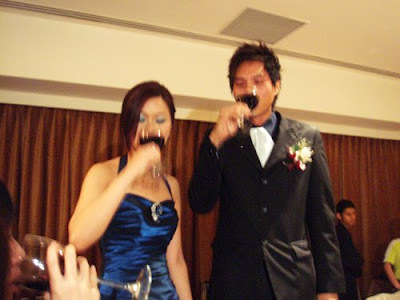 Usually the groom will get tipsy by the time they ended their rounds but this time we seemed to have forgotten to toast so only a full glass for the whole night. Besides they hadn't eaten so not too good to drink on an empty stomach. What an amazing wedding! I really like that 'bribing' part. That is soo unique. Thank you for sharing this, I really enjoyed reading it and I loved hearing about your rituals as ours are completely different. 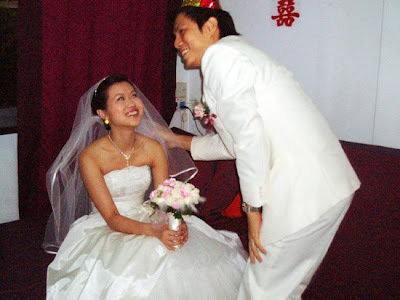 I think its great how you get the groom to do all those tasks before her can meet his bride. I would have loved to have seen what you looked like in the dresses you made after all that effort you put into making them. That pig definately looked creepy too and very hot and bothered lol despite the fact its dead anyway :|. I agree with the creepiness of the piggy--but reading about the wedding was so interesting. I enjoyed all of it!